Olympus' New PEN E-P3: Dual Cores in a Camera? Yes Please. Micro Four Thirds cameras continue to muddy the question of why you'd want anything bigger—Olympus' successor to the E-P2 possibly being in the vanguard. The new little giant's got a major spec bump, and a gorgeous new body. The PEN E-P3's sensor packs the same megapixelage as its predecessor (12), but it's less noisy. The EP-3's got extremely speedy autofocusing and shutter speeds (what felt like twice as fast as my E-P2), 1080i video, a peppy OLED touchscreen, and, yes two processing cores. This means your photos are chomped in parallel, spitting data to your memory card and display simultaneously, allowing for extremely snappy photography. It felt great—one of the most responsive cameras I've ever had my hands on. Olympus tucked these guts in a tremendously satisfying stainless-steel case (fat grip optional). It's not heavy, and feels like it could take a battering on top of being very, very pretty (that white one!). If sturdy mechanical controls aren't your bag, the touchscreen lets you change imaging options with your fingertips, and, of course, lets you flip through photos iPhone style. Should you not want something as large or quite as sophisticated, Olympus also has two other new Micro Four Thirds shooters—smaller and smallest. The PEN E-PL3 (L for Lite) and E-PM3 (M for Mini) have the same pixelage, image processor, and fast focusing, but lack the touch OLED and many of the image settings. The latter lacks a manual mode dial entirely, consolidating controls to the menu wheel entirely. But they're small. Very small—even by point and shoot standards. And of course, being Micro Four Thirds machines, they can still swap lenses with the E-P3 (or any other compatible shooter). Olympus is mum on availability and pricing for the midgets, but the E-P3 should land sometime in July for $900 with zoom or prime lens, and the diet models before "the holiday"—which is admittedly a pretty giant range. Price tags for those two should be about in line with current models— the E-PL3 at $500-ish, and the E-PM3 a couple hundred below that. All told, I'm pleased to see the format expanding with feet planted in both design and high function. CENTER VALLEY, Pa., June 30, 2011 – Today Olympus launches three new PEN compact system cameras designed to help inspiration-seekers capture their unique visions and share their stories in brilliant still images and high-definition (HD) video. The Olympus PEN family combines the portability of a point-and-shoot with features found on bulkier cameras or camcorders to deliver amazing image quality and lightning fast speed. With a new 12.3-megapixel Live MOS Image Sensor, TruePic™ VI Image Processor, high ISO of 12,800, a reengineered autofocus system, full 1080i HD video with Dolby Digital sound recording, newly designed user interfaces and a variety of Art Filters and built-in creative features, these powerfully simple cameras offer advanced capabilities without the complexity of a digital single lens reflex (DSLR) camera. PEN E-P3: Also announced today, the flagship Olympus PEN with a classic, all-metal design and the world's fastest autofocus**. A body portable enough to travel the world without sacrificing DSLR image quality and control that experienced photographers expect. It features a bright, 614,000 pixel, high-resolution, OLED touchscreen to easily navigate and control the camera at the touch of a finger. PEN E-PM1: The smallest and lightest Olympus PEN is available in six stylish colors (purple, pink, brown, white, silver and black) and features a new and simplified user interface as well as a streamlined button structure for superior ease of use. Its small size and portability make it the ideal camera to document life's fun and spontaneous moments. A large 12.3-megapixel Live MOS Image Sensor delivers the highest quality images. Take great photos in low-light environments thanks to the Olympus PEN E-P3 camera's built-in flash and the E-PL3 and E-PM1 cameras' bundled accessory flash. Each camera comes equipped with an AF illuminator and ISO up to 12,800. To improve color and speed, the new Olympus PEN cameras feature the new TruePic VI Image Processing Engine. Photos and HD videos will be crisp and clear thanks to three modes of in-body image stabilization and the award-winning Olympus Dust Reduction System. The new Olympus PEN cameras use a variety of features to achieve speed rivaling that of the professional Olympus E-5 DSLR. Focus and shoot faster with the new 12.3-megapixel Live MOS Image Sensor, TruePic VI Image Processor and new frequency acceleration sensor technology (FAST) autofocus system. The FAST AF Tracking System features 35 separate focus points spread over nearly the entire sensor, enabling pin-point focusing accuracy on small subjects wherever they appear in the frame. Selectable 3x3 groups within the 35-point area are especially effective when shooting active subjects. The cameras' fast shutter response times ensure you will never miss a shot, even in the toughest shooting environments. In-camera creative features such as Art Filters, Multiple Exposure, Aspect Ratios and In-Camera Editing allow photographers to capture the world as they see it. Art Filters set Olympus PEN images and videos apart from the pack. Since they're built into the camera, Art Filters can achieve dramatic results on the go without the need for a computer or editing software. All filters can be applied to both still shots and HD movies. 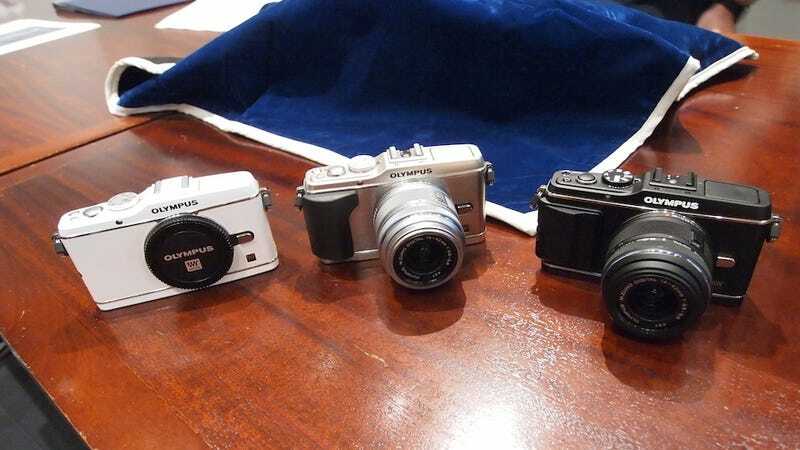 All three Olympus PEN cameras have a 3-inch, high-resolution display. Controlling the E-P3 is simple to use with its three-inch, touch-sensitive 614,000 pixel OLED, consuming much less energy than the traditional LCD. The display has a wide 176-degree angle of view and is bright enough to compose images even in harsh midday light. The intuitive and practical touchscreen makes it easy to navigate the camera's new menus and graphic user interface. Going through a day's photos is easy by scrolling through and enlarging photos with the tap of a finger. The E-PL3 features a tilting 3-inch 460,000 pixel LCD screen that offers the flexibility to capture moments from a variety of angles. The E-PM1 features a 3-inch 460,000 pixel display. All three cameras feature a newly designed Graphical User Interface. The font and graphics used in the menus offer improved visibility and quality to render elegant graphical menus that are attractive and easy-to-use. The E-P3 incorporates a rotational dial and sub-dial on the back of the camera. With just their thumb, users can fine-tune aperture and exposure time in an instant – without the need to switch between menus. Fans of hands-on shooting will love the three customizable buttons that can be assigned to the user's favorite functions. Today Olympus is proud to announce several new Movie & Still Compatible (MSC) lenses with high-speed lens drive mechanisms delivering near-silent autofocus during still shooting and high-definition (HD) video capture. New accessories include optional body grips and the FL-300R external flash to complement the PEN series perfectly and broaden the creative horizons for any photographer. The growing Olympus PEN MICRO Four Thirds family now features eight fully-compatible MICRO Four Thirds lenses. The legendary Olympus Zuiko® Digital Four Thirds range of 27 high-quality lenses, OM-series and other manufacturers' lenses can be attached to Olympus PEN cameras with optional adapters. Each new PEN comes packaged with the re-sculpted M.ZUIKO DIGITAL 14-42mm II R f3.5/5.6 II R zoom lens (28mm-84mm equivalent) or the M.ZUIKO DIGITAL 17mm f2.8 prime lens. Designed with Movie & Still Compatibility (MSC), experience near-silent operation, enabling you to shoot HD movies in stereo with amazing clarity. The tiny-tiny E-PM3, locked in a box for some sad reason.